The National Gazpacho Day is celebrated on December 6. It is somewhat ironic as gazpacho is a soup that is usually served cold. Perhaps this food-related holiday is intended to remind us of summer. Gazpacho is a vegetable soup that originate in Andalusia, Spain. It is very popular in Spain and Portugal where is its typically eaten as a refreshing meal in hot summer weather. Gazpacho is made of raw vegetables. It usually has a tomato base although some recipes omit the tomatoes. Most gazpacho recipes include the following ingredients: tomato, bell pepper, cucumber, onion, garlic, stale bread, water, olive oil, wine vinegar, and salt. Sometimes other products are added such as parsley, avocado, watermelon, seafood, meat stock. 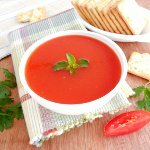 To celebrate the National Gazpacho Day, try to cook this delicious soup which is very easy to make. Roughly chop 4 plum tomatoes, 2 red bell peppers, 1 cucumber, and 1 red onion into 1-inch cubes. Put each vegetable separately into a food processor and pulse until coarsely chopped. Be sure not to overprocess. Combine processed vegetables in a large bowl and add 3 minced garlic cloves, 3 cups tomato juice, 1/4 cup olive oil, 1/4 cup white wine vinegar, 1/2 tbs salt, and 1 tsp freshly ground black pepper. Mix well and leave to chill before serving.